Error pages are not what typically appear on your screen when you're surfing the web, but when it happens it's so annoying! To see how servers work from within, we will build a simple web server by ourselves. We will use Node.js as a server part technology for that task. 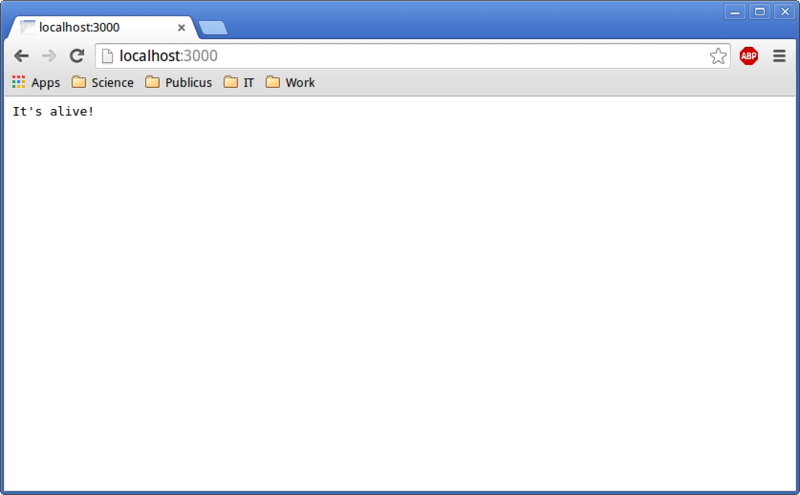 Then we'll use Heroku cloud application platform to turn this local server into a world wide server. Hi, everyone! Don't know how about you, but my weekend was great! And I had to choose my evening movie randomly. It was "Sharknado". Should I say that my Friday was ruined? To be honest, this is not what typically happens when you are surfing the web. But when it does... Man, it's so annoying! It's annoying, but we're curious, aren't we? And, for our curiosity to be satisfied, we will build a simple web server by ourselves. It will help us to see how it works (or how it won’t work) from within. Pretty simple, but it's a server! Then check it in your browser. 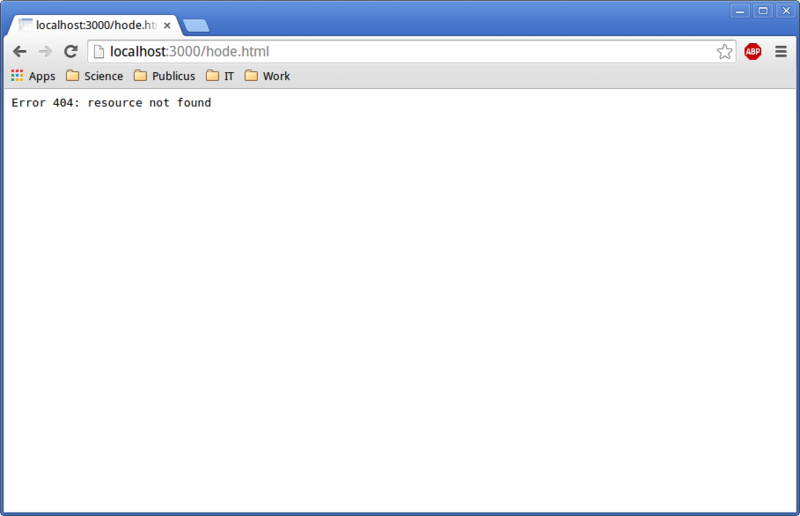 Your new server's address, as you may guess, is http://localhost:3000/ Mine is working. How about yours? Hope, it's working too. Well, it is a server! And we have evidence. What you got here is your own client-server model, which can fit in your bag! Take it any place you want! It will be a good idea to deploy our server online, so everyone could see it. This code performs a request for some resource. When the response comes back, an anonymous function is called. It contains the argument data, which is the data received from that request. So, Node allows you to use the so-called event loop, which works faster because of non-blocking behavior. For example, nginx uses an event loop with asynchronous I/O. That's why it's fast as hell! This is not so hard to understand this conception in outline, so let's move along. Works fine. But it works locally. WWW is for "World Wide Web" and we will turn your local server into a world wide server. We'll use Heroku cloud application platform for this. Heroku is a cloud platform as a service (cool long-bearded programmer guys call such type of things "PaaS"). It allows you to deploy your web server, so everyone could see how awesome you are as a web developer. First of all, you need to create an account on developer's site and install Heroku. This is not so hard. Just follow the instructions. There is also instruction on Heroku's site that can explain you how to run your first simple web server, which returns you the "Hello, World!" string. 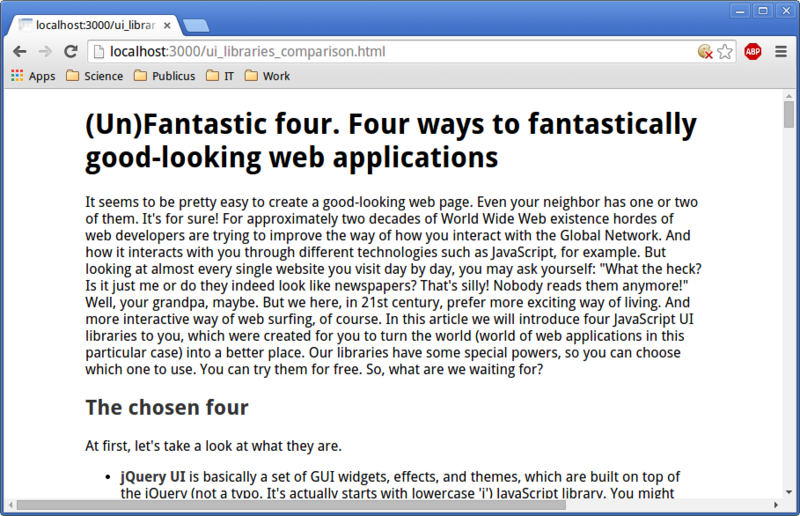 You can try it, but I think that it will be more interesting if we build our own web server from scratch. Sounds exciting, huh? We will leave Heroku for now. But we'll need it soon after we build our server. Now, the creation. 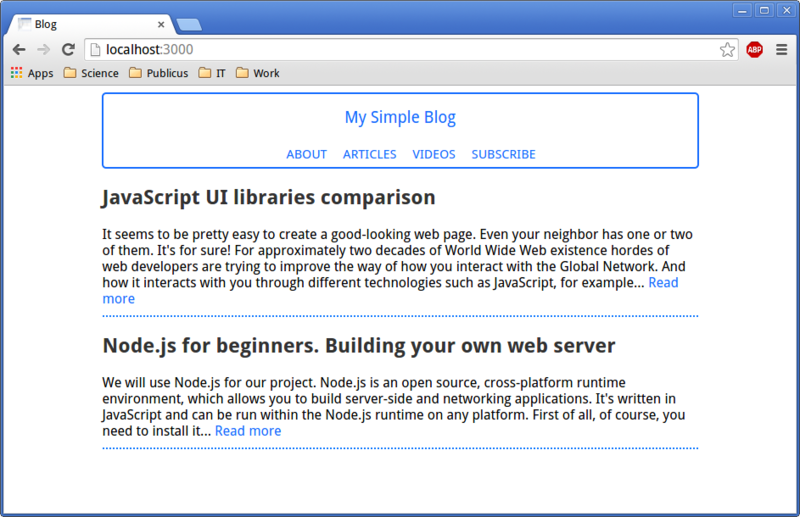 It will be a simple blog with basic functionality. It will show you requested web pages and the error page in case of an error. Create your project directory. And then create the server.js file inside of it. The first one will give you the key to Node's HTTP functionality. The second one is for possibility to interact with the file system. The third one allows you to handle file paths. The last one allows you to determine a file's MIME-type. And it's not a part of Node.js, so we need to install third-party dependencies before using it. We need to create the package.json file for that purpose. It will contain project related information, such as name, version, description, and so on. For our project we will use MIME-types recognition, because it's not enough to just send the contents of a file when you use HTTP. You also need to set the Content-Type header with proper MIME-type. That's why we need this plug-in. It will create node_modules folder and place all the files inside of it. So, we resolve our dependencies and can return to our code. Nothing sophisticated with this one. It returns plain text when server can't find a page. Notice the way we handle the MIME-types. You can use the port_number variable later. For example, in console.log() function to tell the user, which port is used. This is your homework for tomorrow. That's all we need to run our simple web server. Now it's time to create some content. We'll create the public folder and two folders inside of it: stylesheets and images. We'll put all our HTML files into the public folder.The stylesheets folder is for CSS files. And the images one is for pictures. You are free to create your own CSS file if you don't like our design. What we are interested in for now is how our server handles the 404 error. That's why we created two "Read more" links. The first one is connected with the actual HTML file within the public folder. The second one is broken. Let's test how it works. We tested our simple server locally and now is time to deploy it. Empty Git repository will be initialized in .git/ folder. This command allows Git to track your files changes. git commit -m "Simple server functionality added"
Heroku will generate a random name for your application. In my case it's enigmatic-citadel-9298. Don't worry. You can change it later. This command will open your Heroku project in your web browser. In this particular case, server address is https://myfirstserver.herokuapp.com/. Now you can share your first web application with any person you want. ...it will make your DIRTy job for you. There is an acronym created to describe such type of applications Node.js was created for. It's DIRT. It means Data-Intensive Real-Time applications. Node allows a server to handle a lot of connections and work with a number of requests at the same time. And you don't need much memory for that. It's designed to be responsive and fast. Just like your web browser! So, it's useful when you need to create an application that will be able to respond instantly to a large number of users. And Node was built from scratch to provide you with such a functionality. Well, that's enough for today. Hope you liked it. See ya!